Melissa earned a Bachelor of Science degree in Cell and Developmental Biology at the University of Rochester and received her Master’s in Curriculum and Instruction, K-12 Science Education at George Mason University. Teach for America brought her to North Carolina in 2011. She taught at Weldon Middle School for two years. She then spent four years in Washington, D.C. teaching at Achievement Prep Academy in Southeast D.C. and Jefferson Academy Middle School in Southwest D.C., where she served as Grade Level Lead. While in D.C. she was named a Capital Commitment Fellow by DCPS for being an effective, experienced teacher committed to closing the achievement gap. She served as DCPS Travel Ambassador leading study abroad trips for 8th grade students and was a mentor teacher with TechBridge Girls, George Washington University and the University of D.C. Recently, Melissa won a Foundation for Blended and Online Learning Innovative Educator Grant and was named a National Finalist in the NSTA’s Shell Lab Redesign Challenge. Melissa currently teaches 8th grade science at W.A. 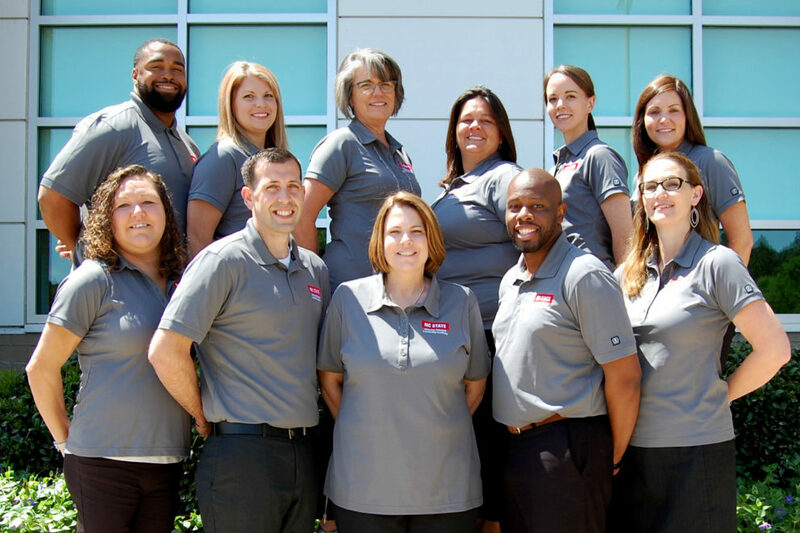 Pattillo Middle School in Tarboro, NC and serves as a Project Manager for ENC STEM, a program that provides high quality STEM learning opportunities and leadership training to high school students in eastern North Carolina. Melissa can be reached at maaltemo@ncsu.edu. Malia earned a Bachelor of Arts in Journalism and a Master of Education from Hawaii Pacific University. As a high school English Language Arts teacher, she has taught all levels and all grades. Transferring between Florida and Hawaii for most of her 12-year career has provided her the opportunity to experience different educational organizations on opposite ends of our Nation. Malia also spent four years out of the classroom as a Support Facilitator, learning powerful strategies to help struggling students and communication strategies to work best with their parents. In addition, she also provided various faculty trainings about Best Practices for Students with Disabilities. Malia also taught writing to elementary students during her summer breaks. She has served as the English Department Head, Instructional Leadership Team Member, SIT member, Presenter at GAFE Summits, Class of 2014 Faculty Advisor, Imua Club Sponsor/Advisor, and Cheerleading Coach. She has been recognized for excellence in Curriculum and Assessment and Exceptional School Leadership. Malia was also selected to represent Hawaii in SBAC trainings across the country. The 2017-2018 school year was her first year teaching in North Carolina and she loves being a West Johnston High School Wildcat. Malia is currently teaching 10th grade English at West Johnston. She can be reached at mlblake2@ncsu.edu. Michelle graduated from the University of South Florida where she earned a Bachelor of Arts Degree in 1995. Her certifications include Elementary Education (K-6) and Academically Gifted (K-12). 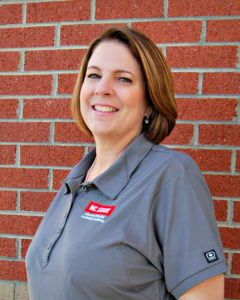 Michelle has 18 years teaching experience in Florida and North Carolina. She was recognized as a Certified Teacher of the Month for Johnston County Schools in 2013. In addition to her teaching duties, Michelle served as a member of the School Improvement Team, MTSS grade level representative, and grade level chair. 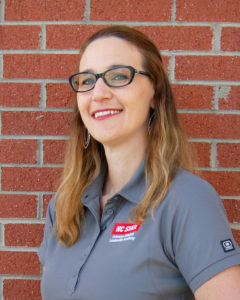 Michelle serves as an Instructional Resource Teacher for North Johnston Middle School and a Teaching and Learning Coach for Johnston County Schools. 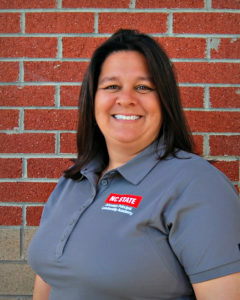 Michelle can be reached at mwbutler@ncsu.edu. 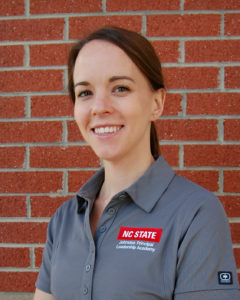 Sarah earned her Bachelor of Science in Middle Grades Education with concentrations in Language Arts and Social Studies and graduated with honors from North Carolina State University. Sarah was selected as her school’s Outstanding First Year Teacher of the Year in 2010. She has taught all grades in the middle school setting. During her years of teaching, Sarah also served as the co-chair of her English/Language Arts PLC and as the Student Government Association adviser. She is currently a Teaching and Learning Coach at McGee’s Crossroads Elementary School. In this role, Sarah serves as the MTSS coach, leads the school Curriculum Team, facilitates professional development at the school and district level, and supports teachers in their continued efforts to improve teaching and learning. In addition, she is an active member of the School Improvement Team. Sarah can be reached at smhoyle@ncsu.edu. Jeffrey earned a Bachelor of Science degree in Elementary Education at East Carolina University. 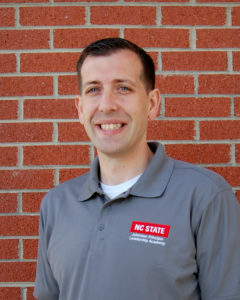 He was recognized as a Beginning Teacher of the Year in 2012, Teacher of the Year in 2015 (County Finalist) and WRAL Teacher of the week. 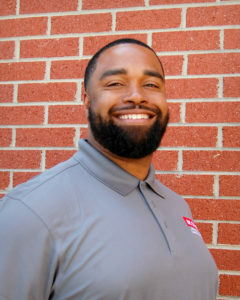 He has served as a member of the School Improvement Team, member of the Teacher Advisory Council, STEM Chair, Science Coordinator, and Beginning Teacher mentor. One of his favorite quotes is, “The aim of education should be to teach us rather how to think, than what to think — rather to improve our minds, so as to enable us to think for ourselves,” – John Dewey. He is currently serving as a 5th grade science and social studies teacher at Cleveland Elementary School in Johnston County. Jeffrey can be reached at jwhenry2@ncsu.edu. 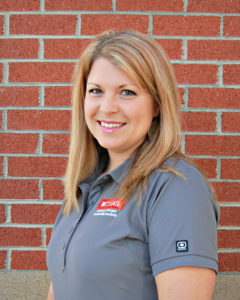 Amanda graduated with honors from Youngstown State University in Ohio with a Bachelor’s degree in Middle Childhood Education. Her degree concentrated in Math and Science with a Reading Endorsement. 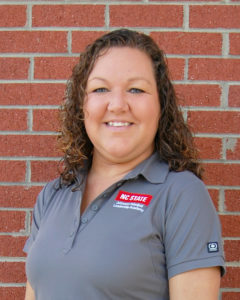 Amanda started her teaching career as a middle school science teacher at McGee’s Crossroads Middle School in Johnston County. After six great years with the same team of teachers, she served as an instructional coach for the next three years. During that time, she supported and streamlined her school’s MTSS program and supported team data analysis. While at the middle school level, she coached volleyball for 10 years, was a member of the School Improvement Team, and was PLC lead. Amanda recently returned to the classroom and is currently teaching Earth and Environmental Science at West Johnston High School. Amanda can be reached at amhuber@ncsu.edu. 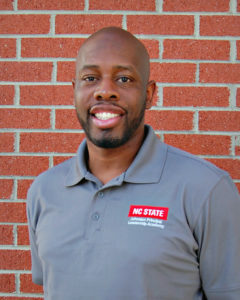 Leshaun is a 2000 graduate of East Carolina University where he obtained two Bachelor of Arts degrees in History and in Political Science. He spent 16 years teaching in the History Department at Tarboro High School in Tarboro, NC. He taught World History, World Geography, Civics and Economics, US History, and Global Studies. He was Teacher of the Year four times as well as the District Global Educator of the Year in 2015 for Edgecombe County Public Schools. Leshaun currently serves as Interim Assistant Principal at Phillips Middle School. Leshaun can be reached at llleshau@ncsu.edu. Dominique is a graduate of NC A&T State University with a Bachelor’s degree in Sports & Fitness Management as well as a Master of Arts in Teaching Physical Education. Dominique was a member of Alpha Phi Alpha Fraternity Inc, where he served as Program Coordinator, and Community service chair where he logged over 1000 hours of community service. Dominique was employed at South Johnston High School where he was the Physical Education Teacher/Head Junior Varsity (JV) Football Coach, Head JV Girls Basketball, and Head Track Coach. Dominique has also served as an interventionist, where he took on a mentor role with “at-risk” students. He is currently serving as an Assistant Principal at SouthWest Edgecombe High School. Dominique can be reached at ddmanson@ncsu.edu. Nicole earned a Bachelor of Science in Early Childhood and Childhood Education with a concentration in Mathematics from Iona College in New Rochelle, New York. Upon graduating, she received her New York State teaching certification and began her teaching career in Bronx, New York. Throughout her husband’s military service abroad, Nicole developed and implemented the Army’s newest kindergarten readiness pilot program, Strong Beginnings, at the Child Development Center in Livorno, Italy and taught first grade at the Livorno Unit School for the Department of Defense Education Activity Europe (DoDEA-E), serving military children from all over the world. Nicole has taught at Polenta Elementary for four years and has served as a coach for the school’s successful Science Olympiad team and a grade representative for the school’s math team. Nicole was teaching kindergarten and was responsible for the English portion of the English-Spanish Dual Language Immersion Program at Polenta Elementary School. She is currently serving as a second grade teacher at Polenta. Nicole can be reached at nmckenn@ncsu.edu. Allison earned a Bachelor of Science Degree in Special Education-General Curriculum with Reading K-12 and graduated with Honors from East Carolina University. Following graduation, she taught inclusion and resource for four years and one year in a self-contained Autism classroom at West Clayton Elementary in Clayton, NC. She also orchestrated parent involvement activities and served as the School Improvement Team County Representative. She spent the next three years of her career at Cleveland Middle School, also in Clayton, where she was the Exceptional Children’s (EC) Department Chair, participated in the School Improvement Team and obtained additional licensure in Middle Grades Math. Three years ago, she was chosen to open the first high school High Functioning Autism classroom in Johnston County at Cleveland High School where she currently teaches and has been the EC Department Chair for the last two years. Allison can be reached at adprice2@ncsu.edu. 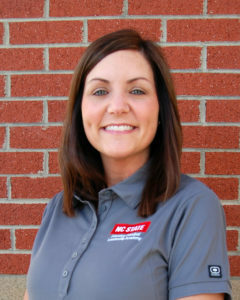 Beth earned a Bachelor of Science degree in Health Education from Gardner-Webb University. She has taught Middle and High School Science in Cleveland County, Charlotte-Mecklenburg, Brunswick County, New Hanover County, and Johnston County school districts. Additionally, she served as the “High Schools that Work” Co-Chair for Burns High School in Cleveland County. She was a participant in New Hanover County’s Leadership Academy and was also recognized as Johnston County Employee of the Month for February 2013. She was recently named Greater Cleveland Chamber of Commerce Teacher of the Year for 2018. Beth currently teaches physical science at Cleveland High School in Johnston County. 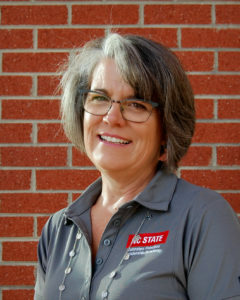 Beth can be reached at merhyne@ncsu.edu.